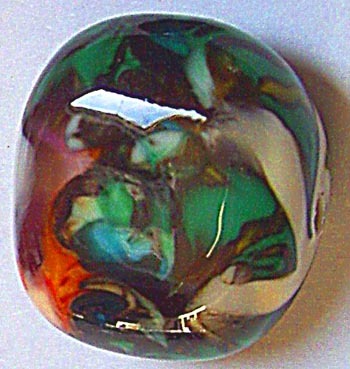 AVAILABLE LAMPWORK BEADS - Marked Sold When Spoken For ! As with all offerings on the site (aside from custom orders) items are sold to the first email to arrive requesting the piece. *If you have question about a piece, do feel free to email me ! Payment accepted: Paypal, check, money order in US funds. Shipping and tax as applicable: If delivered in NYS, sales tax will apply and be added to the total. If you reside in Canada, or in the UK, AU, or Japan I'm happy to ship to you first class for 6.00. Customs forms will be filled out properly and duties/fees may apply once your parcel arrives, so it may be advisable to check with your local post to see what duties/fees may apply prior to purchase. DETAIL IN BLUE $6.95 Painstakingly applied layer by layer these tri-colored dots encircle the bead! Smaller mandrel hole. Bead length aprox 1 1/4 inch. To adopt see top of page! SOLD! (Thanks Kathy!) 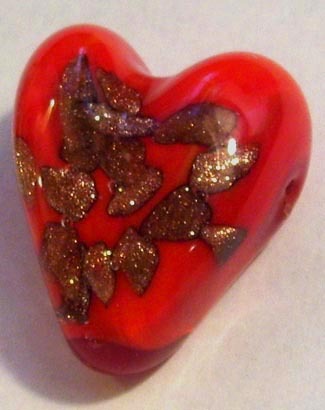 END OF THE DAY BEAD $6.95 aprox 1 inch across aprox 1/2 inch wide tab shape (flat)created on larger mandrel. In the ancient tradition glassworkers end of the day pieces were those that glassworkers were allowed to create (on their own time) using any leftover bits and pieces of material from the days work at their bench. In that time honored tradition I created this bead only using glass bits/shards/remnants from my work that day - true 'one of a kind'! To adopt read above. ESSENCE OF JAPAN $5.95 Painstakingly applied layered dots intermingle with mono-color dots. Amid these are had formed stringer/leaf shapes I made & applied to infuse a sense of Japanese detail I find beautiful - understated yet full of presence! Smaller mandrel hole. Bead length aprox 1 1/4 inch. To adopt see top of page! THE HEART KNOWS $7.95 Strings L-R as seen larger mandrel filled with shimmering adventurine and then deeply encased in crystal clear glass. A deep warm elegant focal (with bling! lol) Aprox 1/2 inch across as seen. To adopt see the top of this page for info.